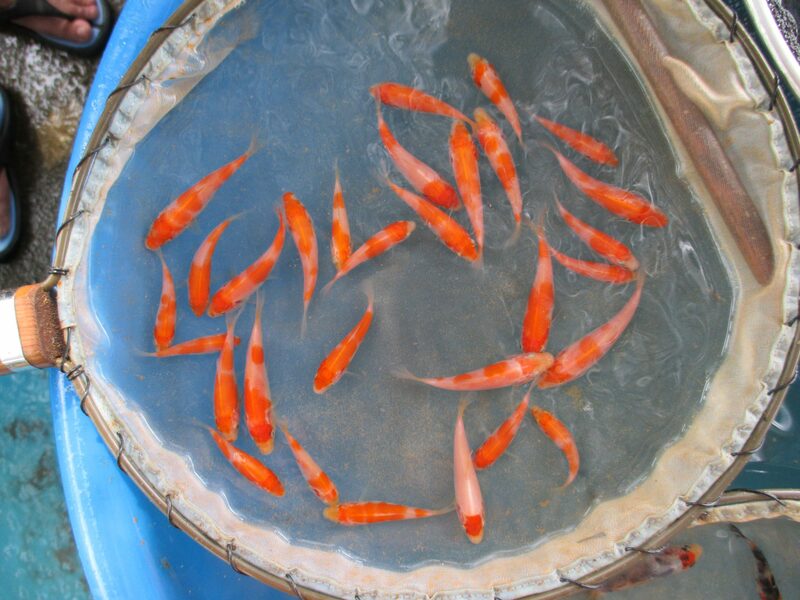 Marugen Koi Farm is pleased to showcase the baby offsprings of our new female Kohaku oyagoi, named “Red Beauty”. 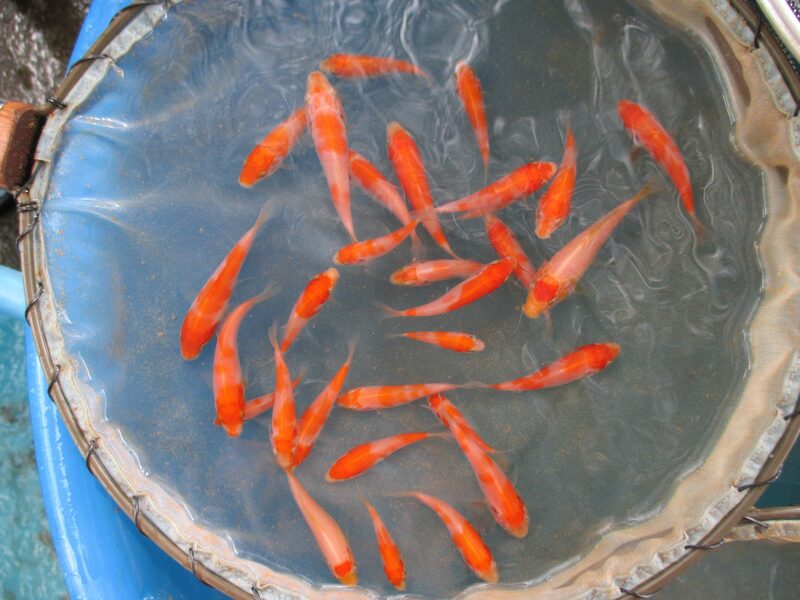 At just an adolescent age of 1.5 months old. 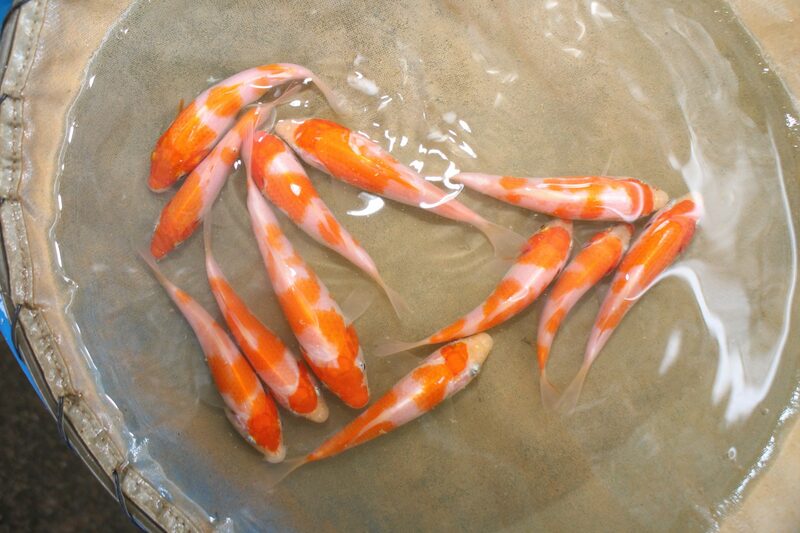 these baby kohaku koi fishes already develop interesting and beautifully marked “orangy” beni patterns, which without doubt will only darken into deep red hi, liken to their parents. 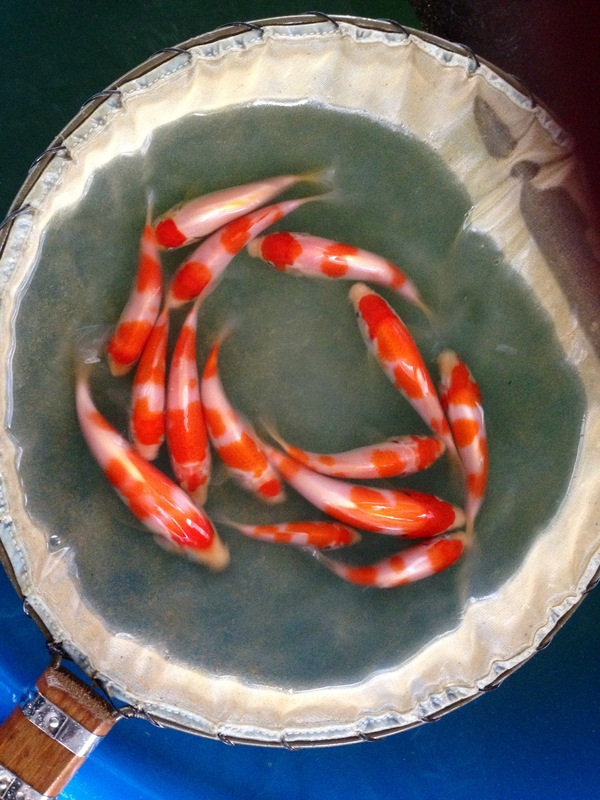 Their female parent fish, “Red Beauty“, is a Kohaku bred by Nogami Koi Farm. 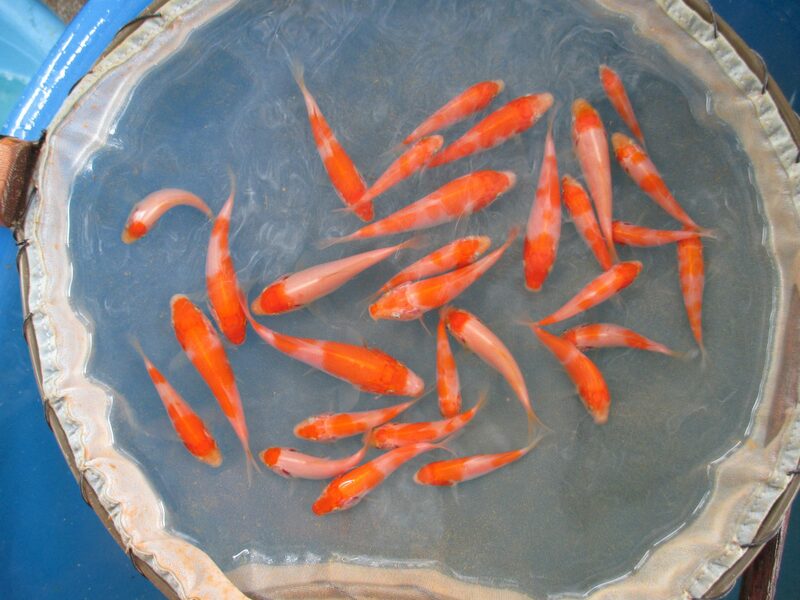 Female Oyagoi, “Red Beauty“, is a Kohaku bred by Nogami Koi Farm, which explains the shiny deep red beni with very cleanly-cut kiwa, accompanied by snow white shiroji skin. 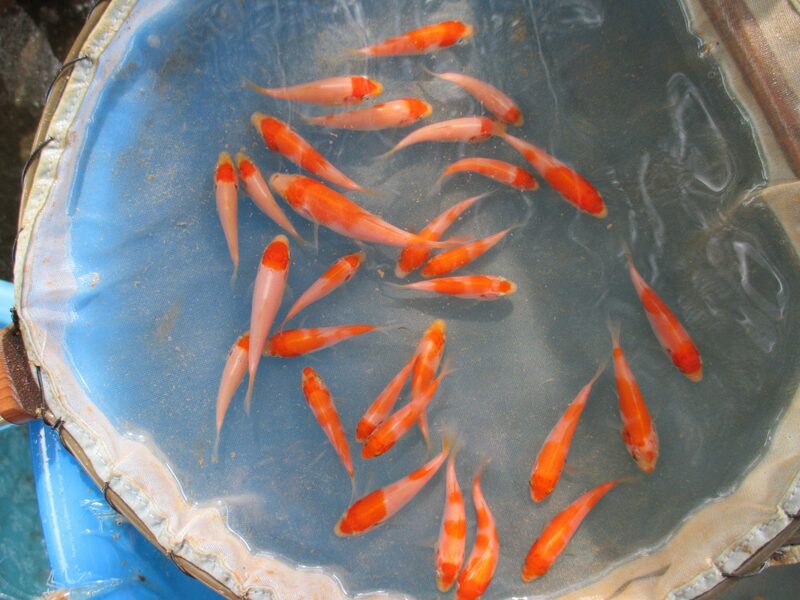 Female Oyagoi “Red Beauty“, with Male Oyagois from Sakai Fish Farm. 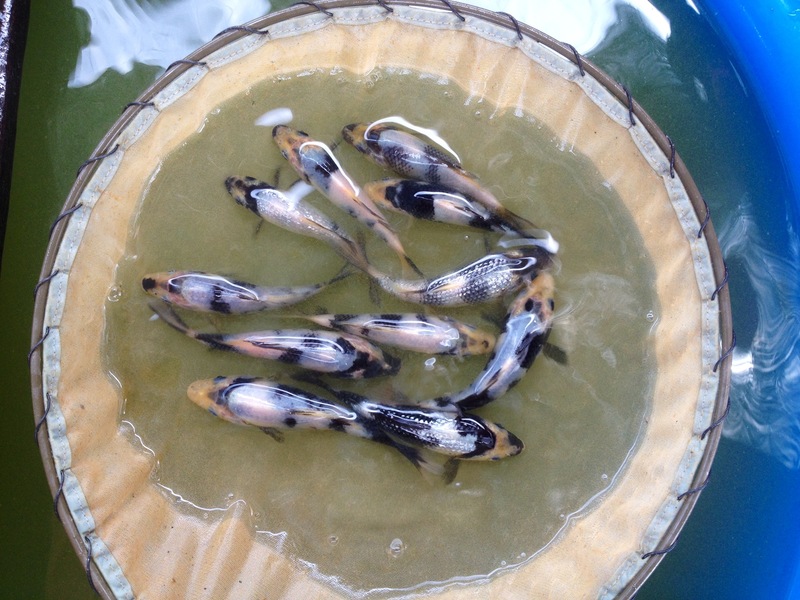 Marugen Koi farm is pleased to showcase some pictures and video clips of Black Beauty’s offsprings, baby shiro utsuri koi fishes, now at 1.5 months old. 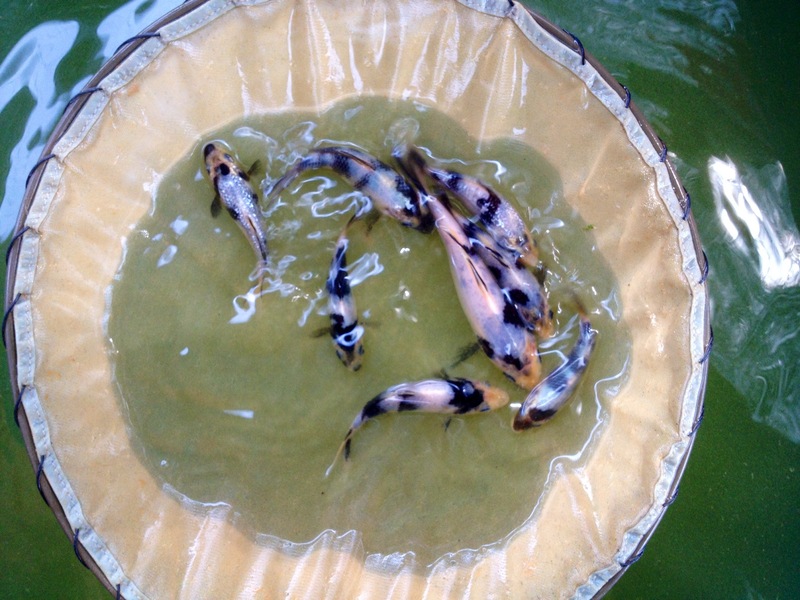 Female Oyagoi “Black Beauty” is a Ginrin Shiro Utsuri of Omosako Koi Farm bloodine. 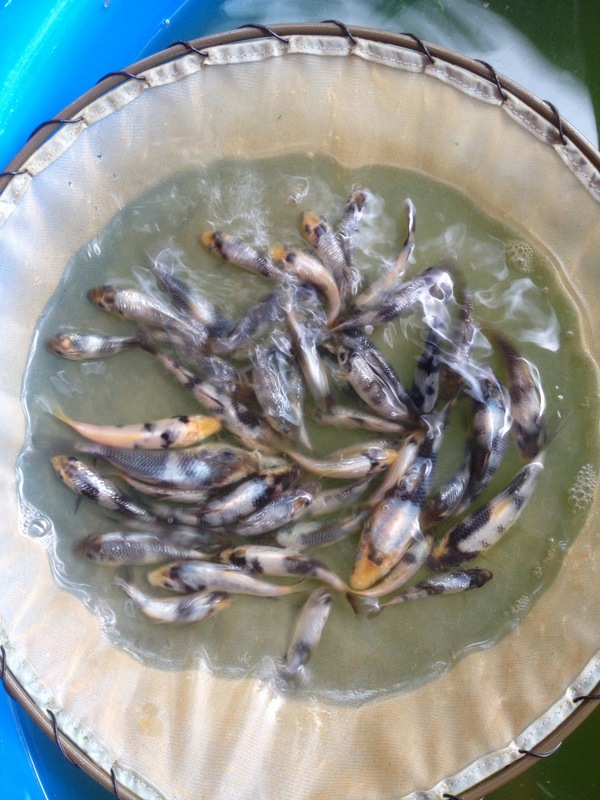 Marugen Koi farm is pleased to showcase some pictures of Black Beauty’s offsprings, baby shiro utsuri koi fishes at 1 month old. 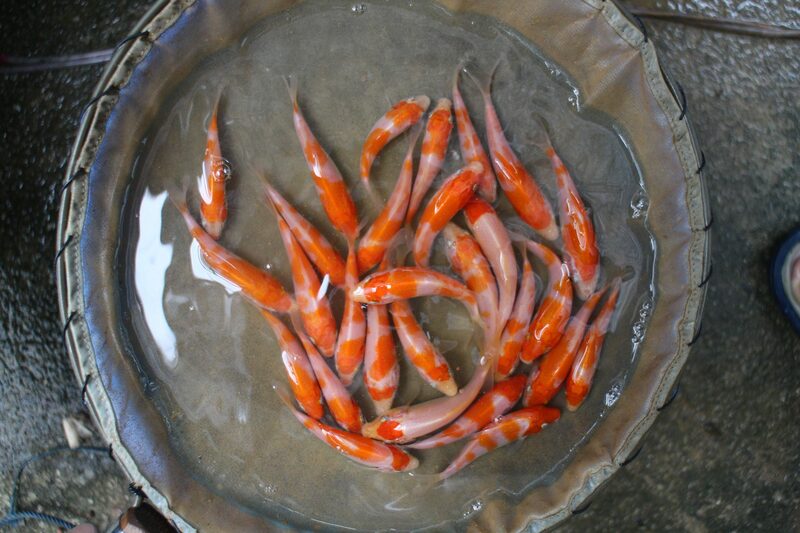 Marugen Koi farm is pleased to showcase some pictures and video clips of M Tanchozuru’s offsprings, baby kohaku koi fishes now at 2 months old. 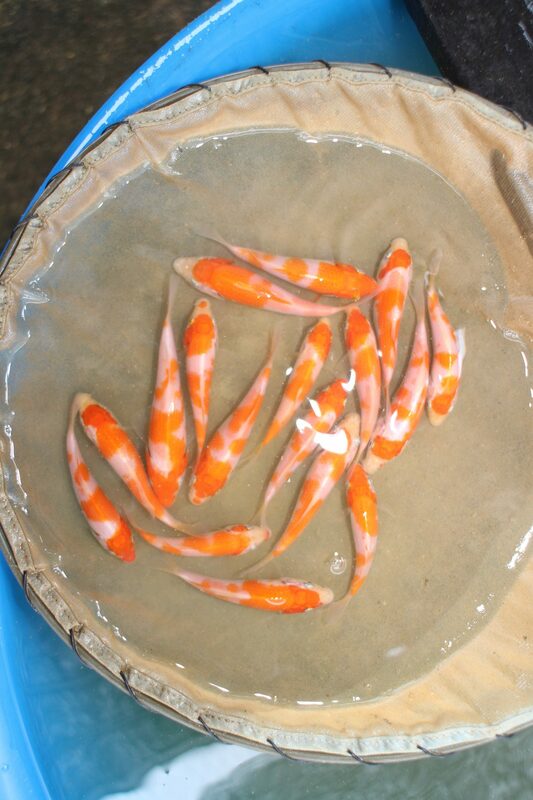 At just 2 months of age, beautiful kohaku patterns have started to blossom on these cute little baby kohakus. 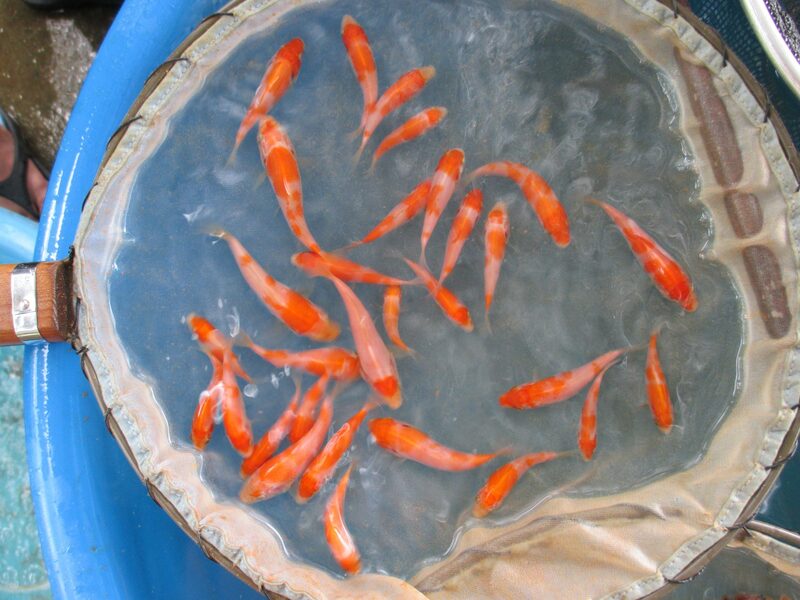 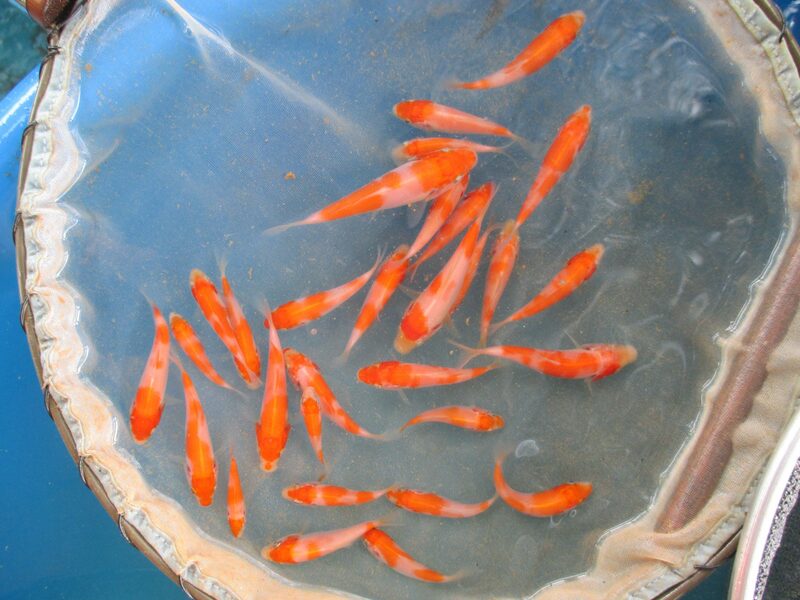 Marugen Koi Farm has very high expectations for these baby kois, and have already received numerous interested order requests for these M Tanchozuru’s offsprings. 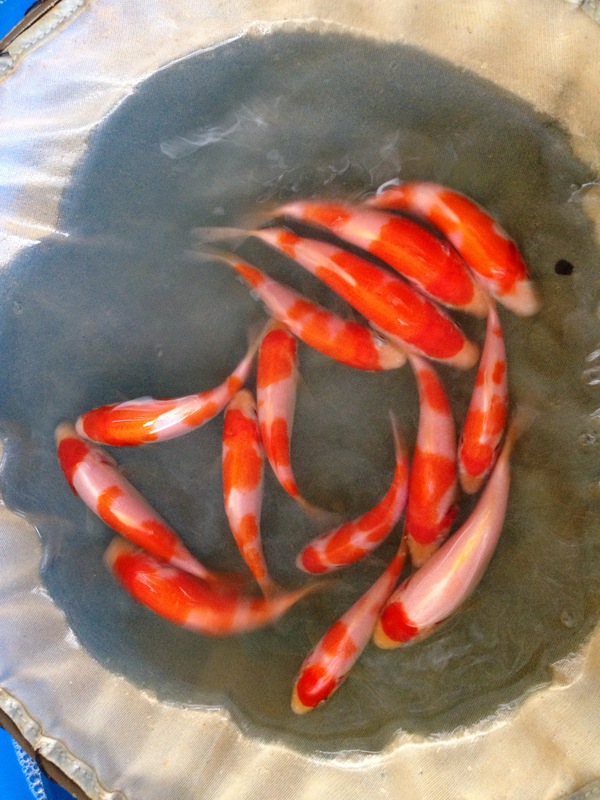 Enjoy the following pics and video clips. 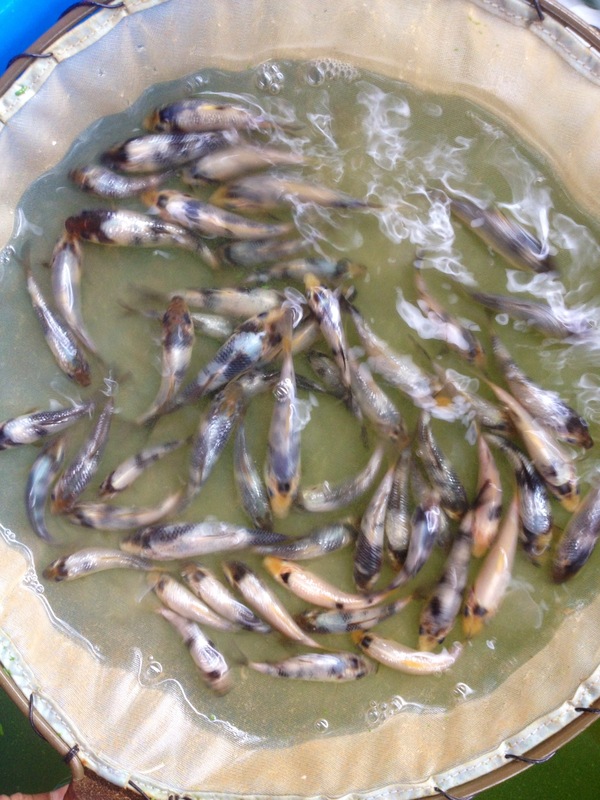 These lovely kohaku babies, and many of their specially selected siblings, are currently being groomed in our Marugen Koi Farm’s mud pond facility; where minerals and nutrients that are found naturally in the mud pond, act as essential health supplements for the baby kois to grow healthy and develop better. 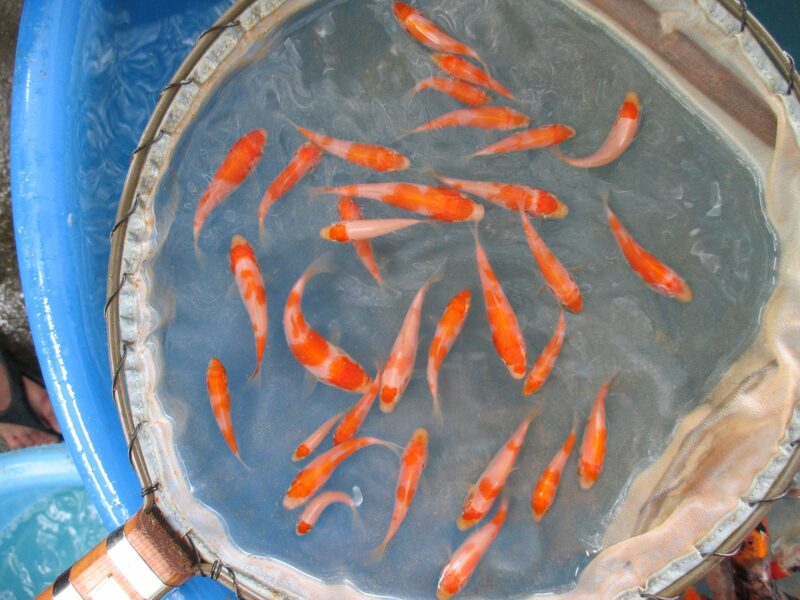 M Tanchozuru is the proud mother and female parent koi fish to the above baby koi fries. 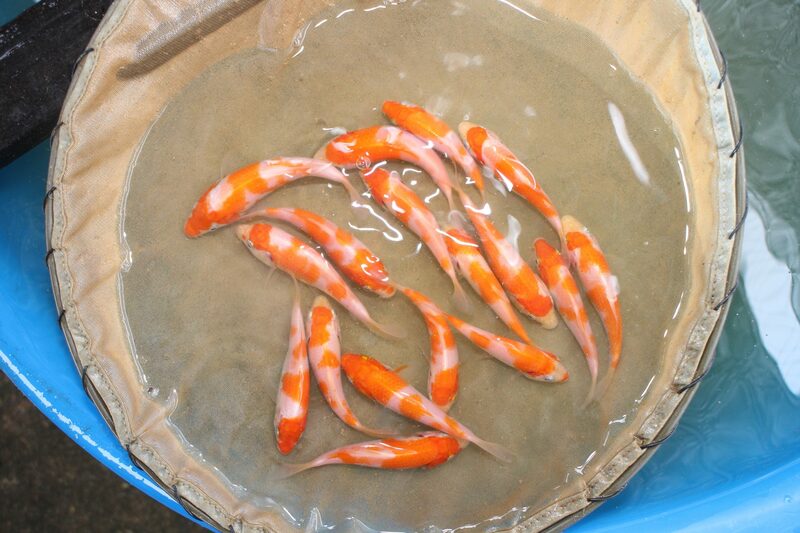 She is a beautiful Tancho Kohaku (snow white skin), bred by the world renowned Japanese Koi breeding farm, Sakai Fish Farm. 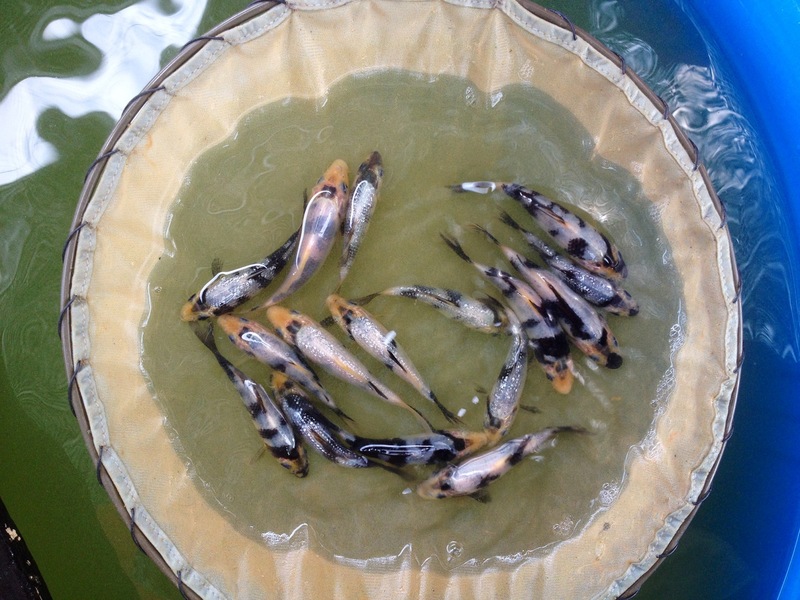 Marugen Koi farm is pleased to showcase more pictures and video clips of M Tanchozuru’s offsprings, baby kohaku koi fishes at 1 month old. 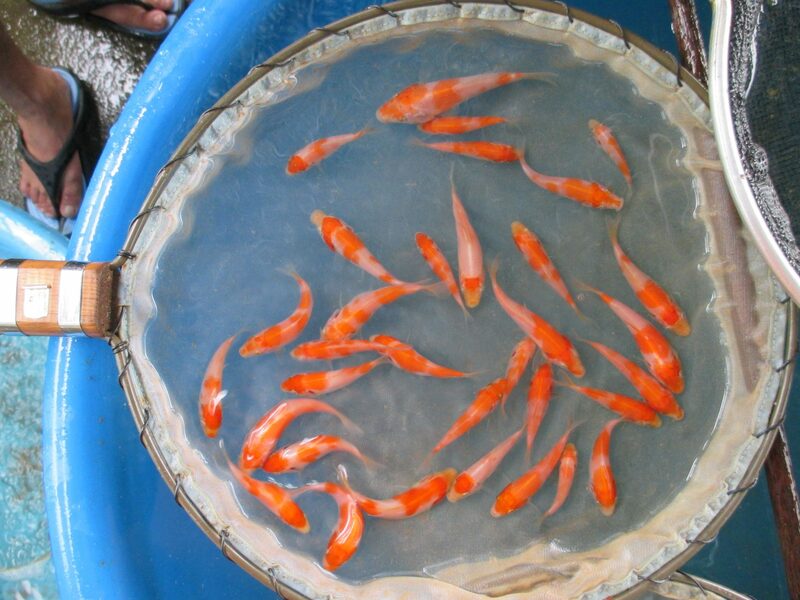 At just 1 month of age, beautiful patterns can already be observed on these cute little baby kohakus. 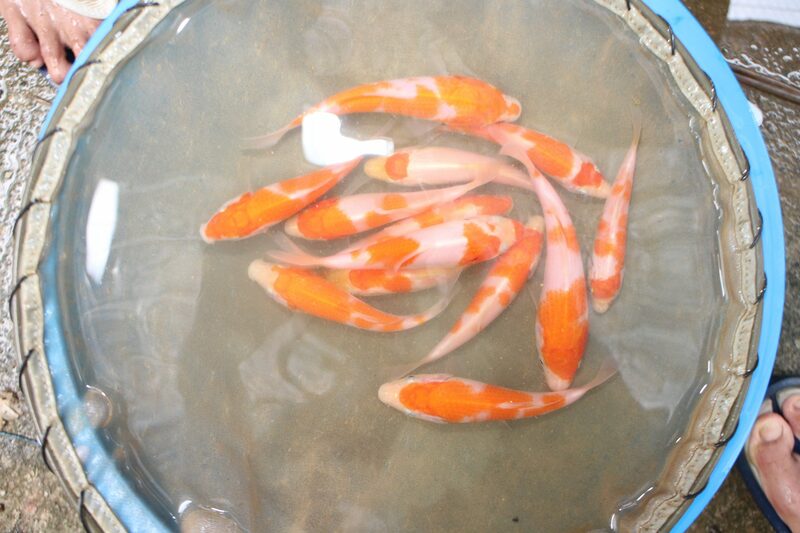 Marugen Koi Farm has very high expectations for these babies, and have already received numerous interested order requests for these M Tanchozuru’s offsprings. 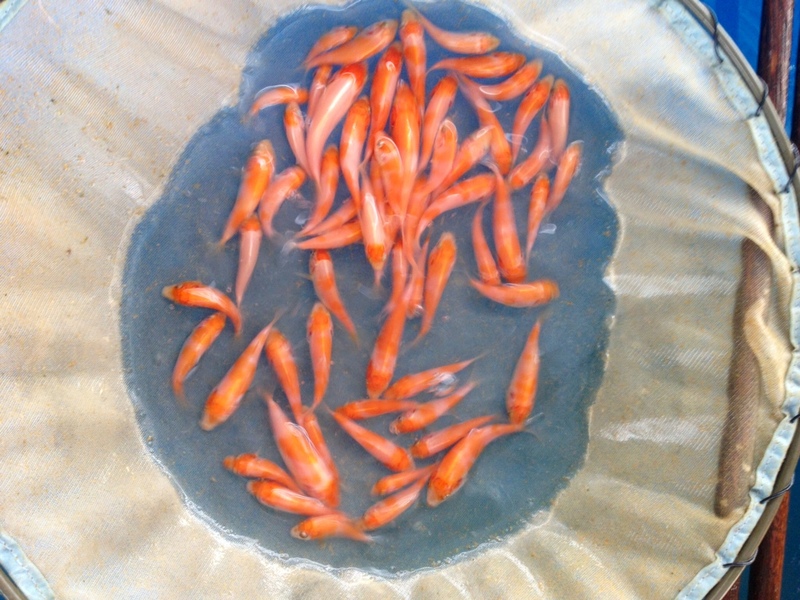 Enjoy the following pics and video clips. 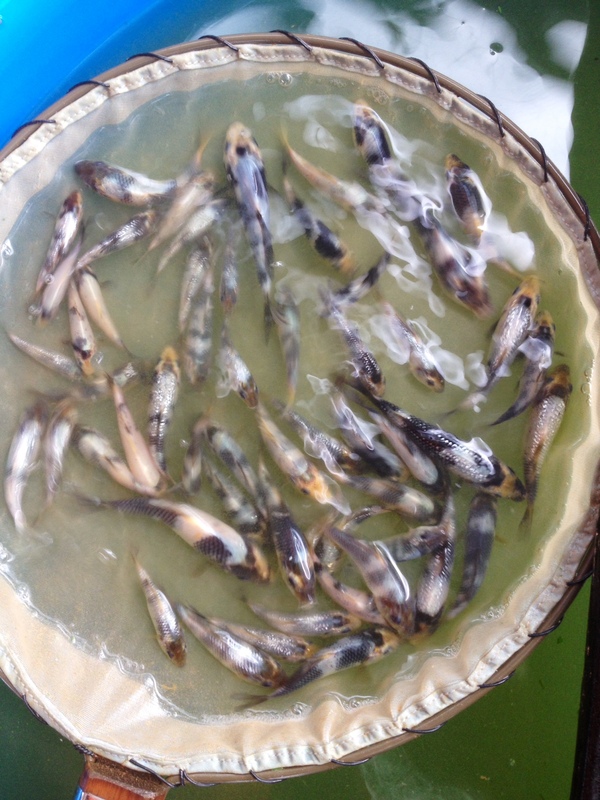 Picture and video were taken during the culling process. 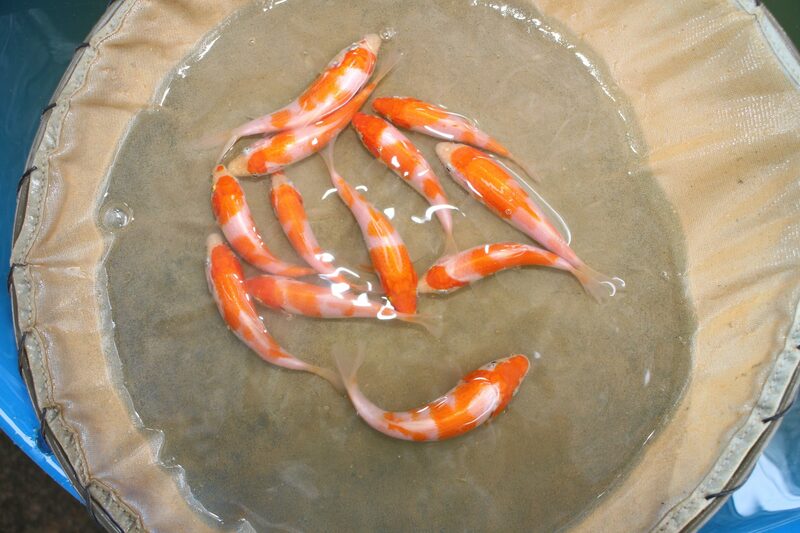 These lovely kohaku babies, and their specially selected siblings, are now back into the mud pond for further growth development. 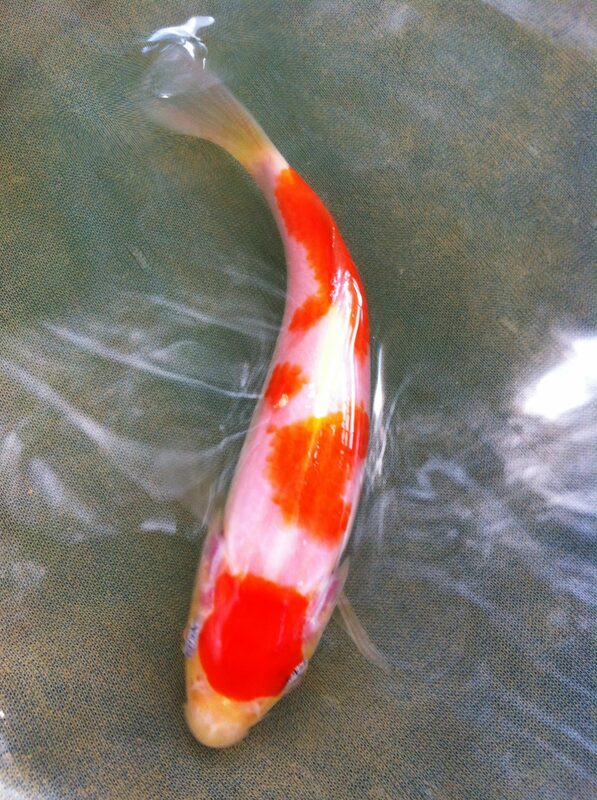 M Tanchozuru is our new oyagoi, and female parent fish to the above baby koi fries. 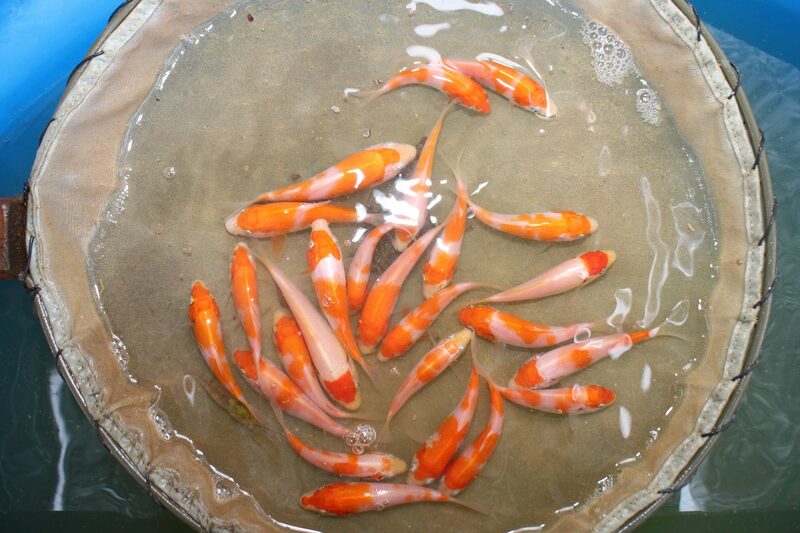 She is a beautiful Tancho Kohaku (snow white skin), bred by the world renowned Japanese Koi breeding farm, Sakai Fish Farm, which happens to be the new World Record Koi Farm holder for the Most Expensive Auction Koi Fish, for a Sakai Sanke in the recent Sakai Fish Farm Koi Auction 2013. 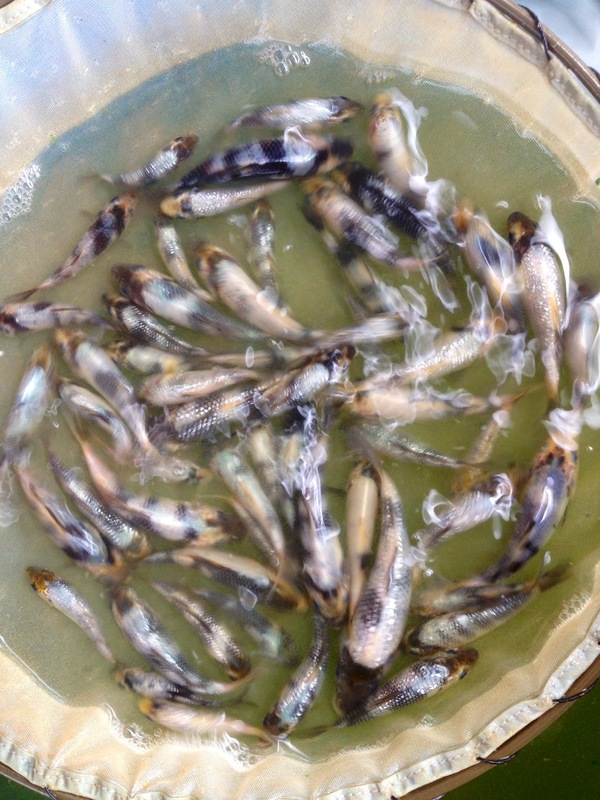 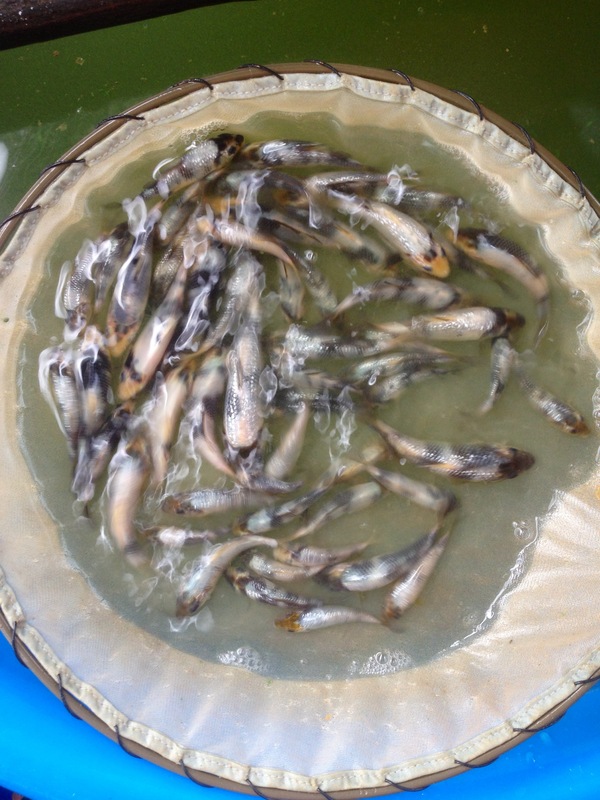 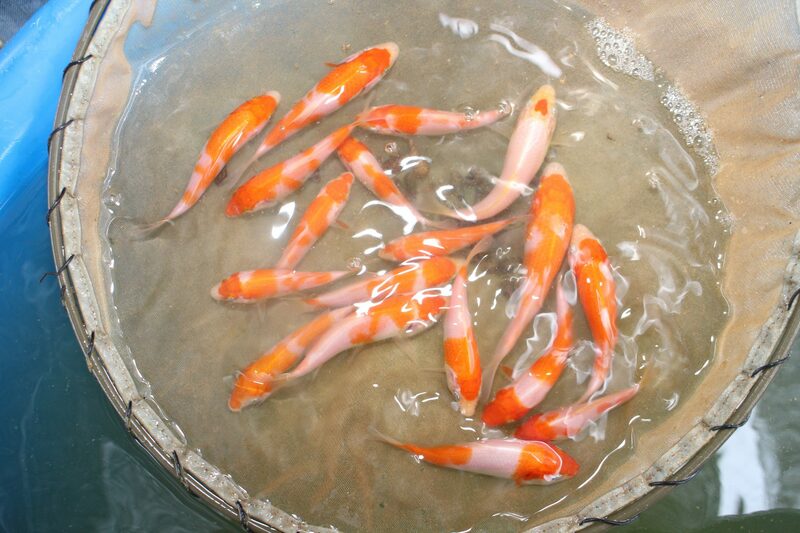 Marugen Koi farm is pleased to showcase a glimpse of M Tanchozuru’s offsprings, baby kohaku koi fishes at 1 month old. 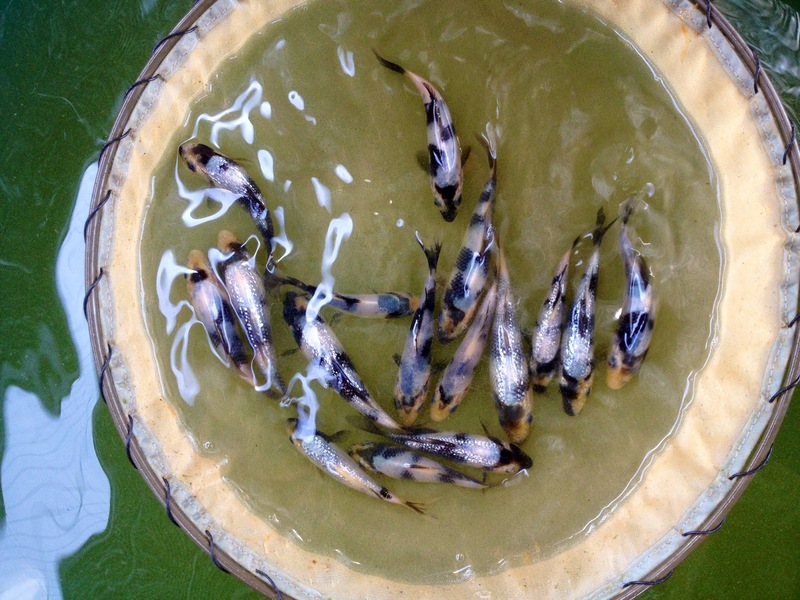 At only a young tender age of 1 month, nice patterns can already be observed on these cute little baby kohakus. 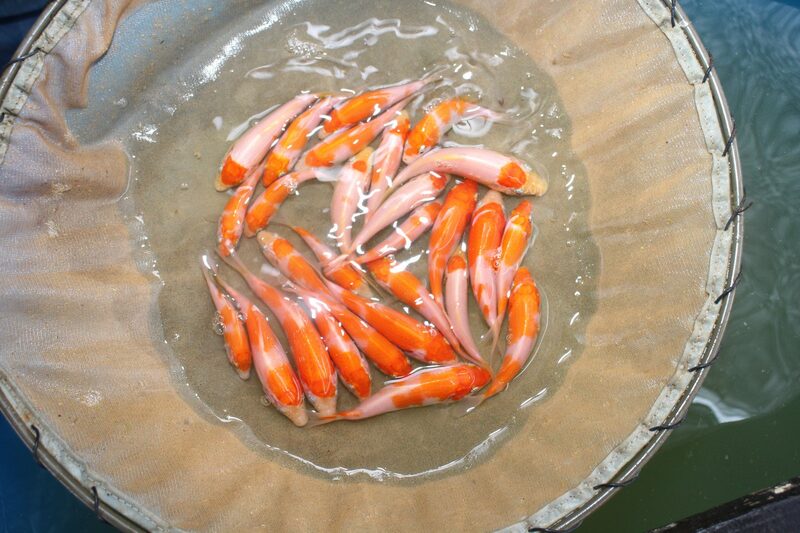 Marugen Koi Farm has very high expectations for these babies, and have already received numerous interested order requests for these M Tanchozuru’s offsprings. 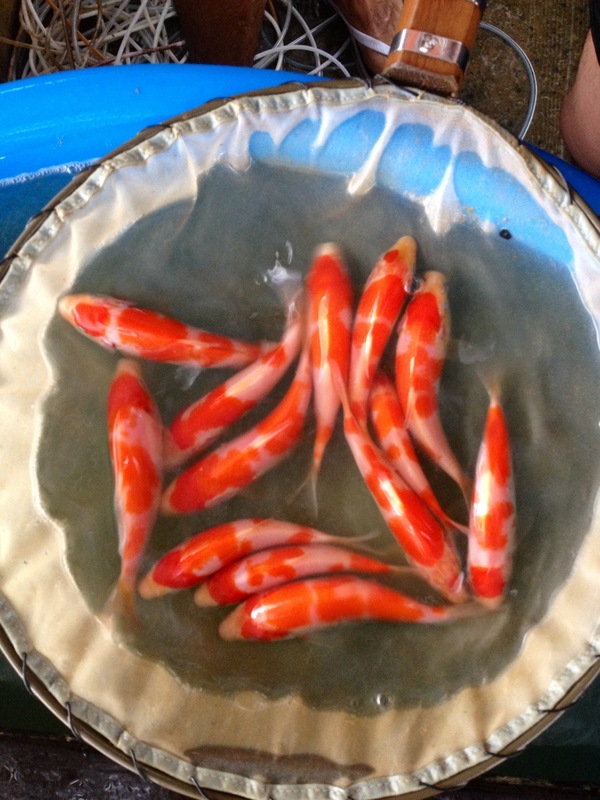 Enter your email address to follow Marugen Koi Farm blog and receive notifications of new posts by email.